Indian-American director M. Night Shyamalan (The Visit, 2015) is at it again with another psychological thriller packed with the tension of boiled linguine and the flavor of skim milk. 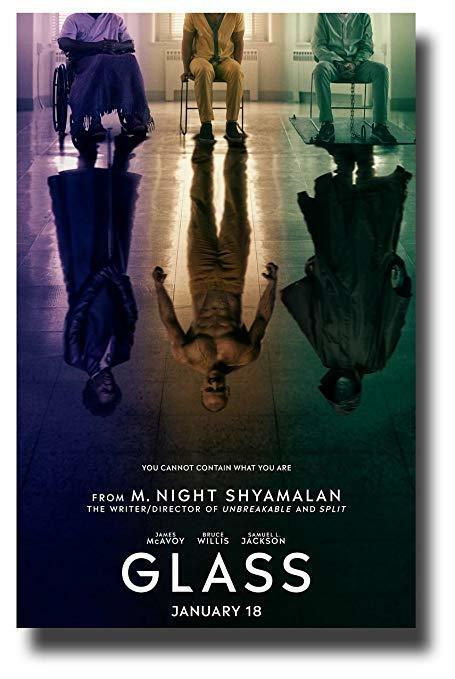 Glass is a continuation of the dangerous lives of 3 men with different super powers living in contemporary Pennsylvania. We first saw some of these characters in the film Unbreakable from 2000 and in the more recent film Split from 2016. Glass is hopefully the conclusion of this bland story featuring an evil genius (Samuel L. Jackson, Incredibles 2, 2018); a reluctant strongman (Bruce Willis, Death Wish, 2018); and a sociopath with multiple personalities (James McAvoy, Atomic Blonde, 2017). Exploring these different men's superpowers and placing them in a realistic, believable context is a tall order that requires a balance of flash and restraint. A balance this movie doesn't have. The 3 mysterious men are trapped in a gray, sterile mental asylum in this movie, each of them planning their escape while coming to terms with the consequences of their powers. Some men choose to be heroes, some men choose to be villains, some people die, and I was left feeling underwhelmed. My heart goes out to M. Night Shyamalan. I think he's made some fun movies (like The Sixth Sense from 1999 and Signs from 2002). But Glass is another mess of too many ideas and meager writing that leaves all the actor's impassioned performances falling flat. I hope Shyamalan starts surrounding himself with a better team of creators, writers, and advisers for future movies.